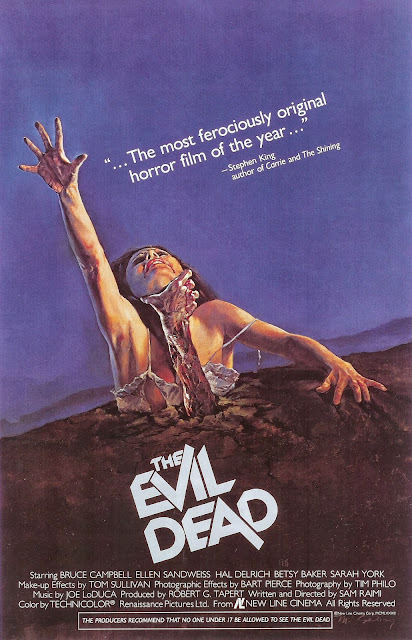 The Evil Dead (1981) is a staple of modern horror and the first theatrical outing for both Sam Raimi and Bruce Campbell. Five friends cross a rickety, old bridge to a lonely little cabin in the woods. They settle in and split up. Soon one of them hears strange voices from the woods saying, "join us" and is possessed to scribble a book with a face. Afterwards she recounts the events to the group when the hatch to the basement blows open. In the basement they find a shotgun, some shells, some audio tapes, a dagger, and a book that looks just like the drawn one. It isn't hard to see why this film has become a cult classic. Despite its ridiculous plot, archetypal characters and dated effects, it knows how to use suspense to build horror. The acting can be a bit rough at times as well, but it gets better as the film continues, and we get to spend more time with Ash. Ashley "Ash" Williams is the nice guy of the piece. It's his car they take up to cabin and he's even willing to drive his sister Cheryl into town after she's attacked by vines. He's played by B-list celebrity Bruce Campbell who is the best actor in the lot.Ash must deal with the harshest punishment the deadites can offer: unwavering psychological assault. Scotty is the group jackass comedian. He's selfish,crude, and juvenile; y'know, the way all horror character seem to be today. The interesting thing is that the rest of the group's not like that, so he actually represents a contrast to Ash and the girls. Oh and he's the one who unleashes the deadites. Shelley is Scotty's girlfriend. She is there to get naked and die. Cheryl is Ash's sister who likes to draw. She is the one who first encounters the demon in the woods. She is involved in the infamous vine scene, which isn't as bad as I remembered, but is still really icky. It's aslo a shame that there's only a brief throw away line that lets us know her relation to Ash. It could have been much more powerful early in the film. Linda is Ash's girlfriend. She clearly loves Ash and they have some cute interaction. It is the biggest blow to Ash when she goes. The Deadites are glib foes with surprisingly variable personalities. Some like to go for the flat out attack, while others prefer to slowly drive their victims insane. High marks for making believable zombies with personality Mr. Raimi. The Demon is the creature in the woods that stalks the teens even during the opening credits. It instigates and aides the deadites throughout and may be responsible for the vine incident. The best thing about this film is that things can go from normal to creepy due to fine camerawork. The special effects are amazing, especially considering the time period and how little money was used. Raimi has an eye for great shots that I'm worried he's lost in recent years. All hope is lost, until a bit of plot convenience saves the day, but this is a horror movie so not so much. This film has been copied and parodied so much that modern audiences may not understand why it's so beloved. Fortunately, there is the fine sense of Ash slowly being driven crazy and worn down that still holds its own against even modern horror films. Check it out if you love horror and want to see it done right! Be sure to check out what DC thought as well! Next Time: Evil Dead II!